To be honest, if a marketing campaign is good in one company, in this case, the business will increase and all the products that are manufactured from that company will be sell in a short period. Many know companies decide to make street advertisements and with this to appeal the people to become their potential customers. If you are curious how looks all this on the street, check these inspiring marketing campaigns in the following but first read some information about the street marketing. Street marketing is the way of promoting products in public places such as streets infamous cities. The main function of this type of marketing is that the advertisements are chosen to be added to the places where there is a lot of traffic. Why? With the aim to be seen by their potential customers. 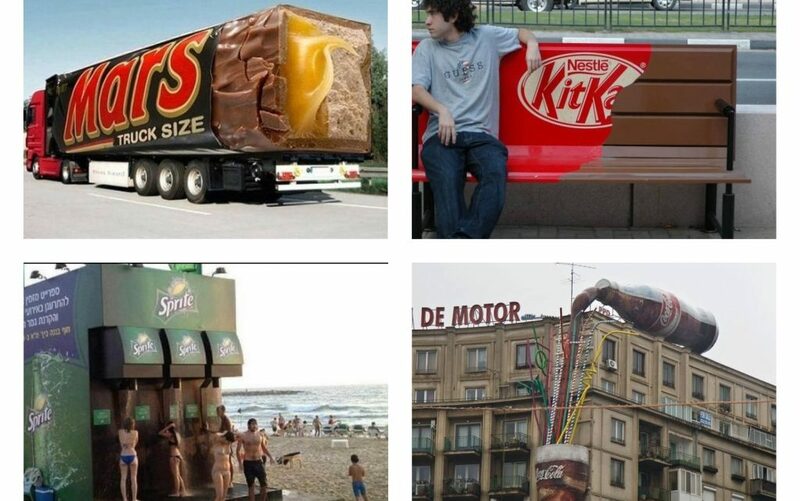 The best way to promote the products is to add the advertisement on a billboard, to add the advertisement on their transport vehicles or to design a seating bench in the park with the same design of their products. Some interesting marketing campaign you will have the chance to see in the following photos, so stay with us and spend quality time! 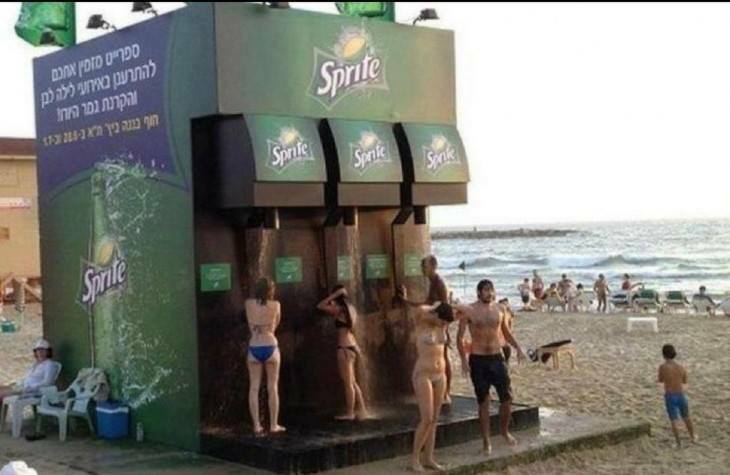 This beach shower was constructed by the company Sprite in Brazil, seven years ago. With this, people are attracted to buy Sprite drinks and to refresh themselves in the best way. When you have your own business and successful company, it’s also important to have own transport vehicle that will keep the design of the products that you are selling. 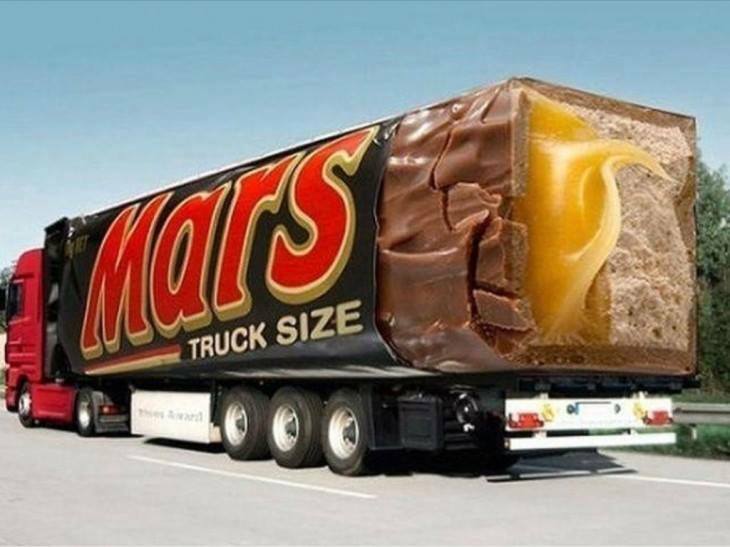 One design like this is the vehicle of the company Mars, take a look. Imagine the feeling to seat on a bench in the bark that have the same design as your favorite chocolate. You will wish to buy it in the same moment! that’s why this is smart marketing strategy that only successful companies can afford it. Every person that pass the street will wish to eat in the same moment. 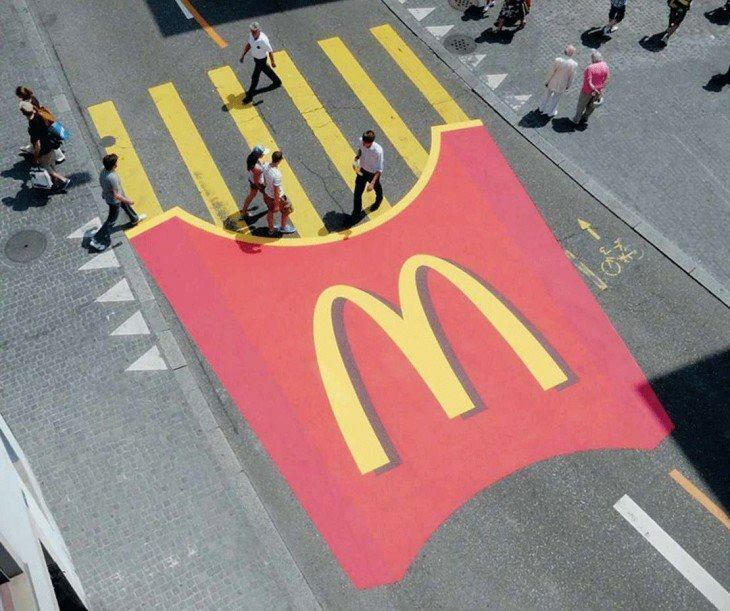 French fries painted on the pedestrian in the street is enough inspiring to make you feel hungry. Spilled Coca Cola bottle on the building where many people are living and many others are passing through the street is so inspiring. Even though this campaign is old, it’s worth to take a look in it and to find put why Coca cola company is so successful company in all world. 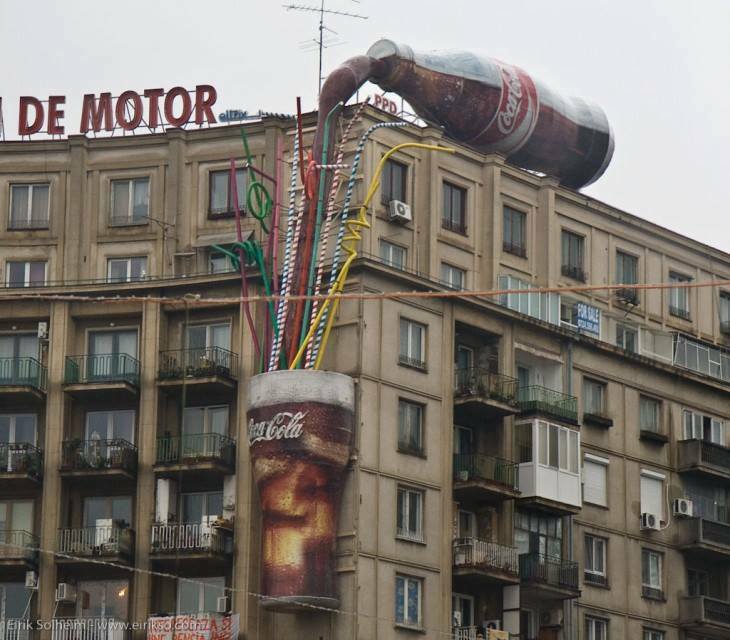 In this photo you have also an example of Coca Cola but this time something different. 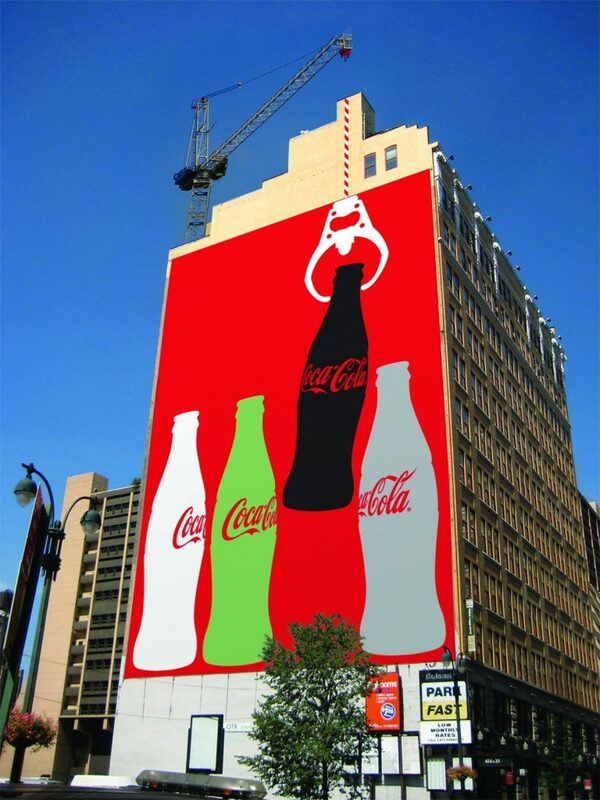 A Coca Cola bottles are painted on the building and the cran is trying to open the bottle. Interesting! 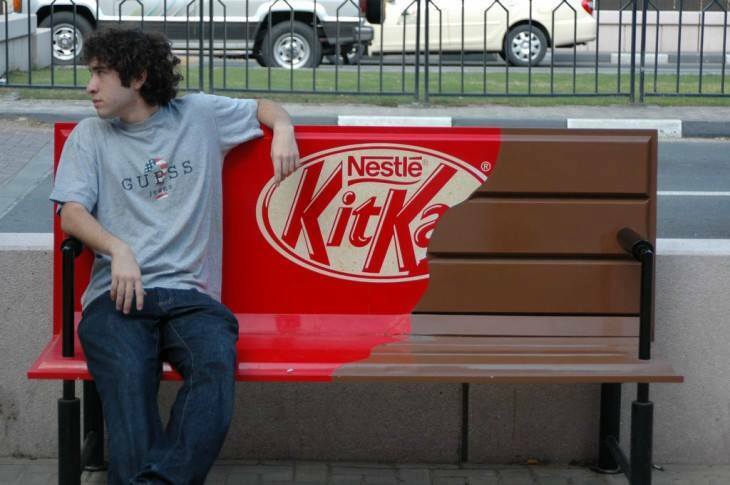 This is all about the street marketing, for more ideas visit our website. Thank you!